Kakigori(かき氷) is the most popular summer sweets in Japan. 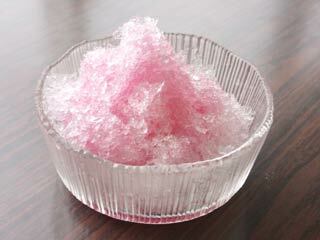 It is an ice shavings with sweeteners. Popular sweeteners are, strawberry, lemon, blue hawaii, melon, milk, sugar, sweet beans, and green tea. Making Kakigori is very easy. Open the Ice Shaver and put Ice in the box. Then, rotate the hand grip. Mix the ice well with the flavor because Ice has no taste. Kakigori is a great sweet for hot day. Enjoy!